The Personalized Fire Fighter Costume is among the most realistic costumes you'll ever see! 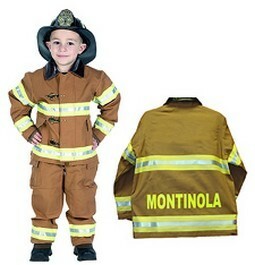 Your child will love wearing this high-end kids firefighter costume, complete with tan overalls and a cute jacket with toggle closures, both of which have reflective strips. Our fireman Halloween costume also includes an official-looking helmet that won't disappoint! Even more, give us your child's name (up to 14 characters), and we'll heat press it on the back of the firefighter jacket in neon yellow film, so your hero won't be misidentified by the chief. You can even have the costume personalized with his name and city for an additional cost! Whether your child is putting out Jack-O-Lantern fires on Halloween or rescuing imaginary victims during everyday playtime, he'll absolutely adore this personalized fire fighter costume for kids! Availability: This Kids Fire Fighter Costume takes approximately 3-4 business days to leave the warehouse plus transit time. 6/12M 4-12 Months 14-20 lbs 22"-29"
18M 13-21 Months old 20-26 lbs. 28"-32"
2-3 2-3 years old 25-33 lbs. 32"-36"
4-6 4-6 years old 32-50 lbs. 35"-44"
6-8 6-8 years old 48-62lbs. 42"-50"
8-10 8-10 years old 54-85 lbs. 48"-58"
12-14 10-12 years old 80-110 lbs. 50"-62"
Youth Small 5-9 years old 32-62 lbs 35"-50"
Youth Large 9-12 years old 54-110 lbs 48"-60"